Prior to French and English colonialism, Pimàdiziwin was achieved through an extended family system wherein one or two people held the responsibilities for protection of families and also the management of lands and resources. Extended families worked together on broad issues or decisions about the larger Omàmìwininì homeland. Many historians have asserted that only men held this role in Omàmìwininì communities but this isn't true as there are several cases of women who served in this capacity. 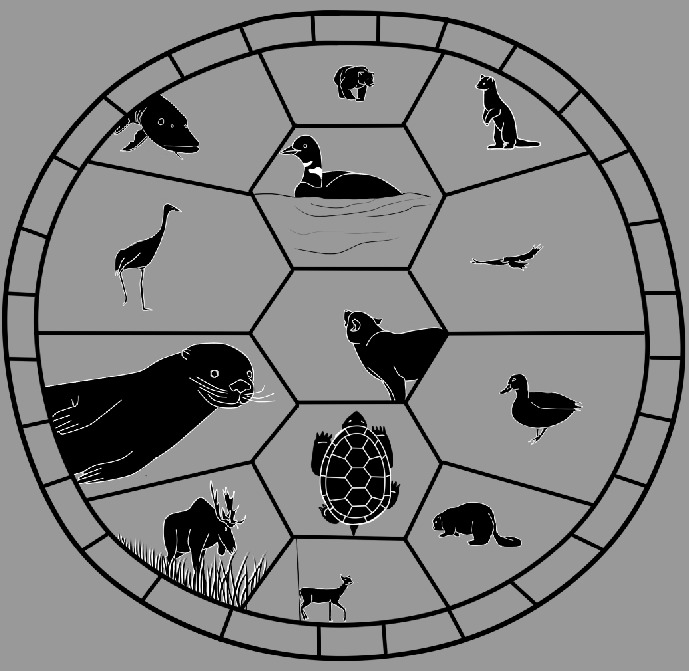 This system developed over thousands of years as Omàmìwininì people developed relationships with the natural world around them. They observed natural democracy at work among animals and other beings and they adopted this system for themselves. They also learned about traditional ways of relating as people from Wisakedjak narratives wherein s'he travelled the world and interacted with all of Creation. In these interactions s'he interacts with each and every being as a relative. Even the smallest creature is seen as a relative and thus decision-making must take into account how a small insect might be impacted or benefit from decisions. After 1800, and particularly after the War of 1812, the continual migration of settlers from the south and from Europe, forced Omàmìwininì to the backlands of the territory as their lands were surveyed and carved off into townships. Lands and watersheds that had been held in common and managed collectively under a consensus system were sold off and occupied by settlers who began clearing away trees. This had the result of driving away animals and destroying sugar bushes. The development of navigation on the waterways caused huge flooding of more lands and Omàmìwininì people lost the ability to harvest many plants as well. Their ability manage development and to maintain Pimàdiziwin was eliminated in many respects and people hung on to small scraps of land attached to marshes and other areas that were designated as unworthy of English settlement. As a result of the process Omàmìwininì people lost the ability to relate to the land and water and spiritual beings in the same way our ancestors had done. After Confederation and the development of legislation and policy in the Indian Acts, Omàmìwininì people were forced to organize themselves under the auspices of a chief and council who were often controlled by Indian agents and the government. Consensus based decision making was eliminated in most cases and more lands and resources were lost. Over the 140 years since the Indian Act was implemented, Omàmìwininì people struggled to survive, banned from practicing traditional governance, ceremonies and social gatherings. Parents were forced to surrender their children to officials for residential schools, and many left the schools with unresolved grief and trauma as a result of the physical, mental and sexual abuse they suffered at the hands of priests and staff. This negative history and legacy continues to impact our abilities to come together to envision a sustainable future. AAFNA reconfigured itself using the traditional family head system back in the 1980's during the rice war. As discussed in the section on Manòmin the Province of Ontario had tried to sell commercial licences for harvesting Manòmin and AAFNA, other Indigenous peoples, as well as settlers came together to stop it from happening. Over the past thirty years it has worked fairly well and people have gone in and out of leadership depending on the context and issues facing the community. In one sense, this is very much a traditional way of selecting leaders. In times of crisis, people who have particular skills step in and lead in those circumstances and then are folded back within the community when the issue has subsided. Because of the Indian Act, our understanding of leaders and even council has been altered and we found ourselves depending on this idea that chiefs are the way to go and that decisions are made by them with some advise from a council. The family head structure also does not work well when it is defined exclusively through genealogical ties and people within that extended family live far distant from each other. This has been compounded by the struggle with the land claims process over the past twenty years. As a community AAFNA has been in and out of that process as we tried to deal with the long standing issues related to our lands and resources. Some leaders saw this as a way to resolve those issues, but this has not occurred. Adding to these larger issues has been a lack of economic autonomy due to the fact that our lands and resources have been controlled by the province and we have little ability to develop an economic base that will create sustainability. As a result various leaders have suggested creative solutions to this dilemma. Some of these were more popular than others, and Its very difficult to create economic autonomy in a way that does not undermine the cultural and spiritual context of what it means to be Omàmìwininì. In some ways, some of the choices we have made as leaders may have been tied to the idea of being Algonquin, as opposed to being Omàmìwininì. Algonquin, as marker of identity does not actually have spiritual connections to our homeland. Some of our ancestors would not even recognize us by that name. Since those spiritual and cultural relationships go back to Creation and to our Omàmìwininì ancestors, continuing to identify as Algonquin could hamper our efforts to decolonize our way of thinking about ourselves and our relationships with our homeland. Developing a sustainable system of organization for the community does not mean it will be the only one for our children or grandchildren. Our cultural traditions and practices have to be able to change and adapt with our contemporary contexts to provide true sustainability. This brings us back again to Wisakedjak and the possibilities we can find in those narratives. What principles can we bring forward into the future that can help us to relate to each other in positive ways that are respectful and positive? Important in this context is the continuation of consensus based decision-making that is truely inclusive of all members of the community. The interim council is working to create a system of governance based upon the extended family system, but not centred exclusively in genealogical ties. In this system, extended families will be made of people who live in one region and thus there is more possibilities of the family head creating opportunities for people who live in that region to get together. We are also working to make the council meetings accessible via the internet so that people can gather in one region and still participate. We are also moving the council meetings around so that people do not always have to drive so far to attend a meeting. So far we have had meetings in Ardoch, Westport, Kingston, and Peterborough. There is no way of getting around the fact that AAFNA is not a reserve community and members live across the entire Omàmìwininì homeland and beyond? We are exploring various tools to resolve the isolation and develop more of a sense of community for members who live too far away to drive to a meeting or participate in cultural activities and/or ceremonies? New technology through the internet could help with this issue. Would a virtual community centre based on things you would find in an in person community centre help people feel more connected if they do not live within driving distance of Ardoch? This is one possibility we are working on. As with many things, this would take funding to make happen and so we are looking at grants as an option. We look forward to your participation in the continuing development and growth of AAFNA as a community going forward. As was the case with our ancestors, we need all of our families involved in whatever way they can for the community to be sustainable into the future.